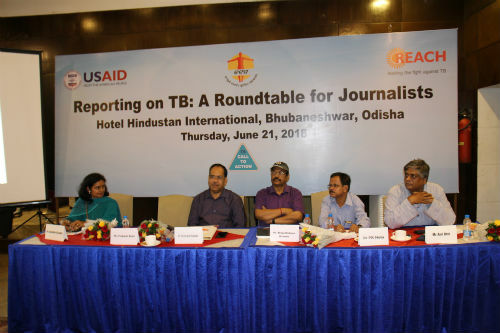 Bhubaneshwar: More than 50 journalists attended a Roundtable for Journalists – an interaction with the media on TB – organised by REACH in Bhubaneswar today. The meeting was organised in keeping with the prioritisation of TB as a crucial public health issue for India and Odisha today. The objective of the roundtable was to provide journalists with updated information on TB as well as recent data and innovations on TB in Odisha and India. The sessions were facilitated by Dr Jayalakshmi Shreedhar, medical doctor and journalism trainer; Dr Sushant Swain, Jt Director (TB), Govt of Odisha; and, Dr. Sandip Kindo, WHO Consultant. The discussions at the roundtable spanned the basics of TB, the disease burden and issues such transmission, risk factors and an overview of the Revised National Tuberculosis Control Program (RNTCP). The socio-economic status of TB, stigma and recent developments on nutrition support and private sector engagement were also discussed. The meeting also saw the participation and inputs of TB survivors and Champions. They shared their stories of resilience and transformation from TB-affected to community advocates and champions of the disease. “As a survivor, I have faced stigma issues, and seen the good and bad of the TB programme. Survivors and their stories, especially the success stories, need greater space in the media,” Tukuna Jena, an entrepreneur and TB Champion, said. The roundtable also featured a panel discussion that brought together Dr Sushant Swain, Jt. Director (TB), Government of Odisha; Mr. Prakash Dash (IIS), DD News Odia; and Mr Anil Dhir, philanthropist and social activist. Dr Shreedhar moderated the discussion. The panellists discussed the kind of stories that the media can cover on TB and the challenges in producing such quality stories. “TB journalism is more than reporting on health. Journalists need to look beyond medicine, into issues such as human rights, deprivation, budgetary allocations and social exclusions,” Dr Jayalakshmi Shreedhar, Consultant, REACH said. Since 2009, REACH has been working closely with the media to improve the quality and frequency of media reporting on TB. REACH has supported journalists with the information that is required to report more frequently on TB, a disease that kills over 1,400 Indians every day.